The Treaty of Versailles put considerable restrictions on the strength of the German military. The infantry was limited to 100,000 professional soldiers and the navy to 15,000 members. The air force was forbidden, as were tanks, heavy artillery, submarines, capital warships, and the production and possession of poison gas. Starting in March 1921, the German armed forces were called the Reichswehr (Defensive Land Forces) in accordance to military law. Members of the Reichswehr had to swear an oath to the Weimar Constitution. It was not the rank and file, however, but above all the generals – approximately half of whom came from the ranks of the nobility – who were hostile towards the Weimar democracy. In the 1920s, however, the military was largely unpolitical; its members, for example, were barred from voting and thus detached from the political system. Moreover, the Reichswehr consciously distanced itself from the domestic tensions that erupted during the Weimar Republic. After Hitler was appointed Reich Chancellor in 1933, Reichswehr leaders exhibited mixed feelings toward him and the NSDAP. Whereas they thoroughly welcomed both Hitler’s demand for a revision of the Versailles Treaty and the prospect of a new direction in foreign policy, they viewed the SA “party militia” with deep distrust. But after Ernst Röhm was dispatched and his SA effectively done away with, the Reichswehr was in full service to the National Socialists. On August 2, 1934, Reichswehr Minister Werner von Blomberg ordered the Reichwehr to swear an oath of allegiance to Hitler personally and in doing so made the military Hitler’s own personal weapon. On March 16, 1935, military conscription was reintroduced by law and the Reichswehr was renamed the Wehrmacht. 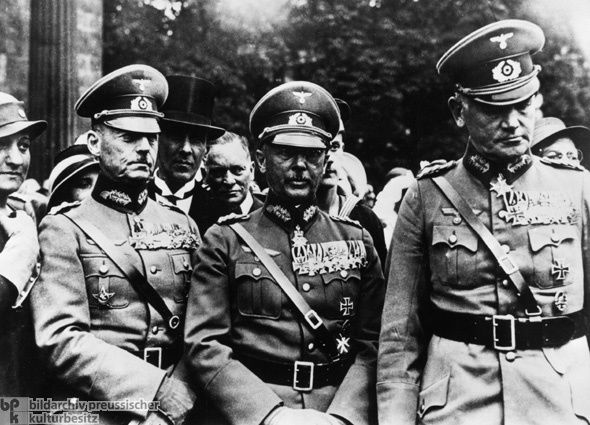 This photograph shows Generals Werner von Fritsch (middle) and Blomberg (right), both of whom were removed from duty two years later after criticizing Hitler’s war preparations. At the left is General Gerd von Rundstedt, who was promoted to senior general in the wake of the Blomberg-Fritsch Affair. Rundstedt participated in numerous military campaigns during World War II and was later charged as a war criminal in Great Britain.